by Bruce E. Logan Jr.
Photo taken in Dallas, Texas about 1901. 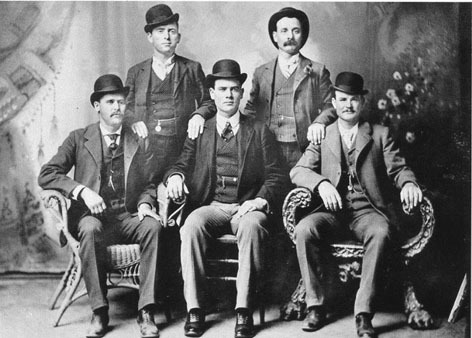 Top row, left to right: William Carver, Harvey Logan "Kid Curry"
Bottom row, left to right: Harry Longbaugh "Sundance Kid", Ben Kilpatrick "The Tall Texan", and Robert Leroy Parker "Butch Cassidy". Much has been written concerning the life and death of "Kid Curry" the outlaw, and much of that writing is completely false. Some of the truth about this famous outlaw will now be shown through genealogical research and evidence given by family members. Kid Curry was born to William H. Neville and Eliza Jane (Johnson) Logan about 1867, in the State of Iowa. The Kid's name was Harvey Andrew Logan. Since it is known from a family source that his sister, Arda Alma, was born in Tama County, Iowa, it is likely that Harvey and his other brothers were also born in that county. It is known that the Logan brothers, Harvey, Johnnie, and Lonnie, rode with Butch Cassidy, The Sundance Kid, and the much publicized outlaw band known as the "Wild Bunch". Many authors mistakenly give the nativity of the Logan brothers as Rowan County, Kentucky. There is, however, only a grain of truth in that assumption. William H. Neville Logan and Eliza Jane Johnson, the parents of "Kid Curry", were raised near Morehead and were born in Fleming County, Kentucky. These facts can be seen from the Fleming County census of 1850, and from the Rowan County marriage records found in the Rowan County, Kentucky Vital Statistics. The area in which the Logan family resided in Fleming County, became Rowan County, Kentucky in 1860. Larry Pointer, in his book, "In Search of Butch Cassidy", points out the Logan brothers indicated, when they registered to vote in Choteau County, Montana, they were born in Iowa. Choteau County was the location of the mining town of Landusky at the time. Landusky was the place that Harvey Logan killed Powell "Pike" Landusky and turned to his life of crime. Today, Landusky, Montana is located in Phillips County near the Fort Belknap Indian Reservation. The census of Tama County, Iowa, listed below, proves beyond a reasonable doubt that Harvey Logan and at least two of his brothers were born in Iowa. The date of birth of James William Logan and some of the birth dates of the other Logan children differ from other genealogical sources. These dates, however, are within the reasonable limits of census research. The original will of Howard Monroe Logan, well know merchant of Morehead, KY, named his niece, Arda Alma [Self] Rodriguez, as an heir. This will gives further proof of the relationship of the Logans of Montana and the Logans of Rowan County, Kentucky. Very little is known of the death of Harvey Logan. There are two documented records of his death and members of the Self-Rodriguez family indicate that neither record is correct. Family members believe that Harvey may have returned to the United States after his alleged death in South America. Perhaps he led a normal life while hiding from the law. Many authors of the "Wild West" note that Johnnie Logan was killed by Jim Winters on February 1, 1896. Johnnie was fatally wounded in a shootout at the Winters ranch near Landusky, Montana. Five years later Jim Winters was mysteriously ambushed, presumably, by Harvey Logan. Both Winters and Johnnie Logan are buried in a pasture near Landusky. On February 28, 1900, Lonnie Logan was killed by a sheriff's posse outside the residence of his aunt, Betty Lee. Dodson, Missouri, where the Lee home was located at that time, is now part of Kansas City. Lonnie Logan, Elizabeth (Logan) Lee, and Hiram Lee are buried in the family plot in Forest Hills Cemetery, Kansas City, Missouri. Betty Lee was Elizabeth (Logan) Lee and was married to Hiram Lee on August 1, 1832, in Fleming County, Kentucky. From family sources and written history it is known that the Logan children lived in Dodson with their aunt and uncle, Elizabeth and Hiram Lee. This move happened sometime after the death of their mother in Gentry County, Missouri in 1876. When the Logan brothers left Missouri is not clear, but they do appear in Landusky, Montana in 1884. William Logan, father of William H. Neville Logan, was the son of James and Caroline Elizabeth Logan. William was married to Elizabeth Ray Powers on Aug. 24, 1815, in Fleming County, Kentucky and lived the rest of his life in what would become Rowan County, Kentucky. Elizabeth Ray Powers was the daughter of Jacob Powers and Ann (Shelton) Crosthwait. Family sources indicate Zachariah R. Johnson and Delilah Evans were the parents of Eliza Jane Johnson. Robert E. Lee, son of Hiram and Elizabeth Lee, was also a member of the "Wild Bunch". Bob Lee spent some time in Federal prison for trying to pass stolen bank notes from the Wilcox, Wyoming train robbery that occurred in June of 1899. Robert E. "Bob" Lee also went by the alias of "Bob Curry". Below is the genealogical evidence of the Logan, Johnson, and Lee families of Rowan County, Kentucky, Tama County, Iowa, Choteau County, Montana, and Jackson County, Missouri. Fleming County, Kentucky - Vital Statistics. Born - Feb. 1852 - Cassander [sic] A. Lee - Parents Hiram Lee and Elizabeth Logan. Rowan County, Kentucky - Vital Statistics (Marriages). October 5, 1856 - W. H. N. Logan, age 22 and Eliza J. Johnson, age 18. Rowan County Kentucky - Morehead Pct. McGowan, Bertha A. Hunt, Harvey Norris and James H. Norris. J. M.
Carey executor should he die or be unable, my cousin, S. E. Logan. Witness: 1 Jan. 1916 Harlan Blair, Mrs. A. G. Simms. Codicil: 19 May 1916, Witness Mr. A. G. Simms & Harlan Blair. property previously deed to wife Elizabeth A. Logan, now deceased. $200.00, $50.00 to J. M. Carey to care for graves of himself and family. sueing Logan for this part of money before his death.